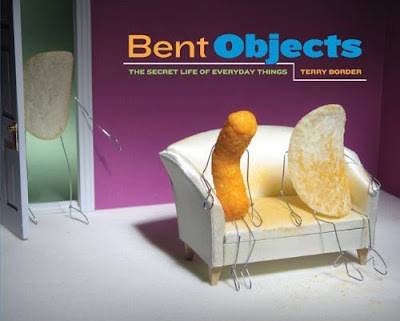 BENT OBJECTS: Today, Bent Objects, The Secret Life of Everyday Things" is in stores. Today, Bent Objects, The Secret Life of Everyday Things" is in stores. Well, here we are, very nearly 400 posts after this blog first appeared September 10, 2006. Today, I'll stop by a couple of bookstores to try and find copies of my book (and then put them on a table near the front door). Yes, today is the first day that it's officially in stores. Hard for me to believe. It's been a long process. 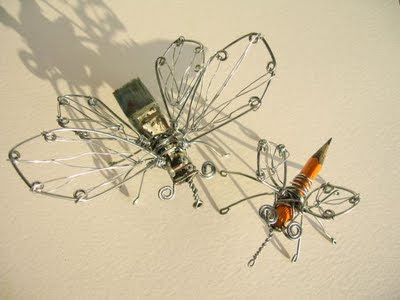 This photo of this pencil bug and paintbrush fly was part of my first post, long before the thought of a book crossed my mind, and even before I thought of using my kinda strange sense of humor. If you have enjoyed my many attempts here over the last three years to add wire to objects, and end up with something interesting, I hope you'll take a look at the book. I'm very, very relieved to say that the early reviews from people who have already received the book in the mail have been very good. or ordering the book from one of the many links on my sidebar on the right. And if you have an uncle or cousin with a good sense of humor? Jon, over at Five Rules For Life, reposted my five rules. They work really well for me (when I can manage to follow them myself).